[Updated Update] Just When You Thought It Was Safe . . . The "Bear Essentials." 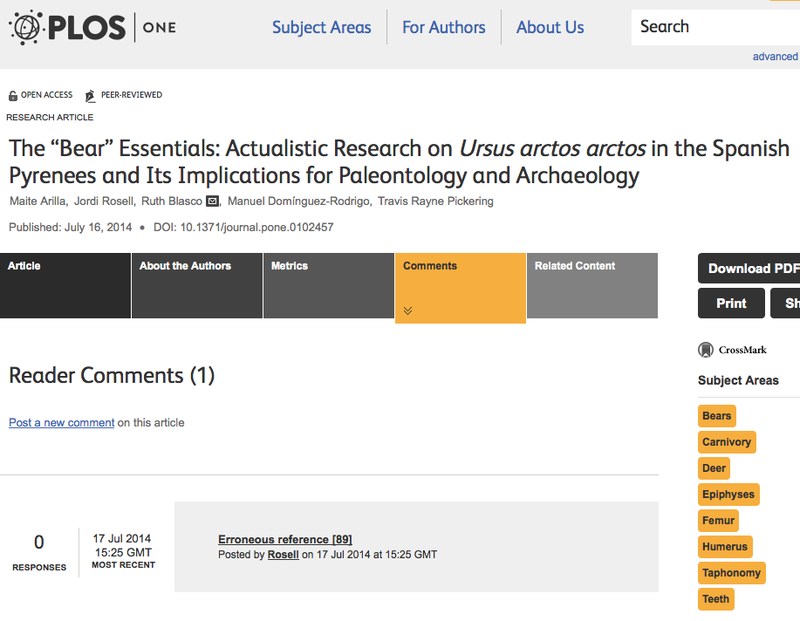 Ruth Blasco, T. R. Pickering, Ursos arctos Bone Modification, and Me! This morning Mick Vernon alerted us to some new actualistic research on Palaeoanthropologica, the Facebook group begun by Charles T. G. Clarke M.Sc. When what to my wondering eyes appeared? 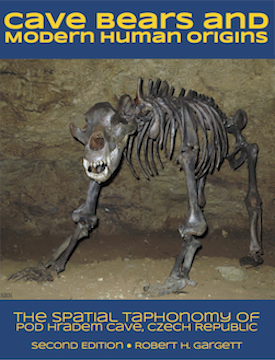 we remain cautious about well-known interpretations that fossil LLB diaphyseal specimens from the Middle Pleistocene cave sites of Yarimburgaz (Turkey) –, Troskaeta (Spain) ,  and Divje Babe (Slovenia)  were punctured by extinct cave bears during the course of cannibalistic feeding. The numbers in square brackets are others’ publications, which presumably contain the problematic inferences these authors are referring to. Cave Bears and Modern Human Origins is reference . I have but one, teensy, weensy, issue with their statement. I. Never. Made. The. Erroneous. Inference. That. They. Attribute. To. Me! N.E.V.E.R!!! So, I sat me down, and wrote me a letter to the communicating author, one Ruth Blasco, of the Gibraltar Museum, colleague of Clive Finlayson, its director—he of the feathered Neanderthals fame—and her co-author of Travis Rayne Pickering—whose work I have pilloried several times in these pages, most notably the inferences of controlled fire us at Wonderwerk Cave. I’ve just discovered your new paper via Palaeoanthropologica, on Facebook. I’ll read it with much interest. But that’s not my reason for writing. As you’re clearly aware, I’ve had something to say about taphonomy and bears, so I was scanning the list of references to see what I’d missed over the decade and a half since I published Cave bears and modern human origins. I have to admit I was surprised to find my book in your references. But I was more surprised to find the context in which you made reference to my work. I’m not unused to having my work misunderstood, to say nothing of ignored, or worse, misrepresented. But seldom have I had words put in my mouth! I have never. N.e.v.e.r. made the inference you assign to me. I don’t even mention Troskaeta. I’d never heard of it until this morning. As you might imagine, I’m a bit sensitive about what people think of my work. Having them think that my basic inferences are mistaken will not help at all with the impression that my peers already have of me. I would hope that you, your co-authors, and PLOS ONE could come to some arrangement, immediately, about signalling to your readers that you’ve made an error in citing me in this fashion. In the meantime, my own readers will be alerted in the very near future. I thought that was rather understated. Temperate. Professional. But firm. Just the right tone. But I’m so pissed I could spit. In The Hitchhikers Guide to the Galaxy, facing the bulldozer that’s about to pull down his house, Arthur Dent queries a construction boss, Prosser, about the County’s plans, about which Arthur had no previous knowledge. Prosser: But the plans were on display. Arthur Dent: On display? I eventually had to go down to the cellar. Arthur Dent: With a torch. Arthur Dent: So had the stairs. Prosser: But you did see the notice, didn’t you? Arthur Dent: Oh, yes. It was on display in the bottom of a locked filing cabinet stuck in a disused lavatory with a sign outside the door saying “Beware of the Leopard.” Ever thought of going into advertising? A few minutes ago, just a couple of hours after I sent the email to Dr. Blasco, I received this gracious note. Clearly the reference to your work should not have been made in this sentence. We will make sure to be more careful in citing your interesting work in the future. Again, please, accept our apologies. So, all better! Well, that’s a matter of opinion I guess. When you click on the link, you’re taken straight to the authors’ retraction. However, if you’re not one of the enlightened readers of the Subversive Archaeologist, what then? What’s the first thing you do? Read the Abstract? Get right into the paper? Look for “Reader Comments?” I thought so. And, after you read the paper? You head straight for the “Reader Comments,” right? Meh. Maybe not. But if you do manage to find the link to “Reader Comments,” this is what you get when you click. The Comments page. But, still no comment. This coyness is killing me. Every other substantive web site in the world just runs the comments on the main page. But not PLONK ONE. Just another link to “Erroneous reference,” a comment by someone named Rosell. *sound of a flotilla of owls entering the room chattering away* Drill down further and you get the creamy centre. Comment 1 page. Ta-Da! The retraction. Like I said. All is forgiven. I’m being charitable. See, my book doesn’t refer to Troskaeta Cave. But it could still say dumb stuff about holes in animal bones. What? You think I’m underestimating the interpretative powers of PLONK ONE’s readers? Mea culpa. I call ’em as I see ’em. B.T. dub, didja get the irony of the so-called page fold inserted after the first part? Who do they get to referee these papers? Don’t ask me. I might spit, now. *But not too pissed to hype my forthcoming e-book. 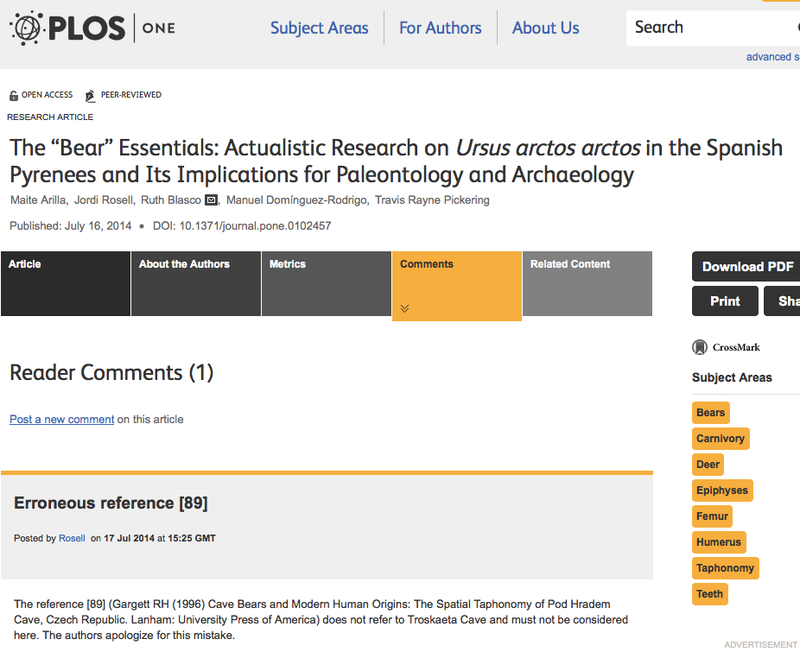 This entry was posted in Blasco, Palaeoanthropologica, Pickering, PLoS ONE. Bookmark the permalink.